Figma News Fridays…is my only post so far this week!Now I truly know what it is to be too busy too blog. But FNF will never be forgotten! This week was looking to be an empty one until Thursday when the plastic floodgates opened, and we got three things at once! There are two preorders, and an update on something from Wonderfestival that I know everyone couldn’t wait to hear more about, so let’s get started! I’ve been a little silent this past two weeks, haven’t I? You can blame Pokémon X for that, but I can assure you that I am having lots of fun! I am now headed for my third badge, and here’s my team: Pancham(named PandaExpress), Azumarill(named Blueberry), Ivysaur(named Midori), Aerodactyl(named Flappy), Jolteon(named Pippa), and Braixen(named Inari). I adore Braixen because of how it fights. You all know that I love magic characters, right? Because I do! The only bummer about Braixen evolving into a fire/psychic(my dream starter *_*) is that I can’t catch any other Psychics(my favorite type). Fairy is also giving me a challenge since I do not always remember their strengths and weaknesses–not to mention the old Pokémon who have been altered. I freaked out when Pancham’s karate chop did nothing to a Granbull. Yet another long awaited addition is the option to customize your trainer, and there are even spots to take pictures! Here’s my trainer in Shalour City. Her name is Sunny! I planned to start out this week by revealing what was in the box I tweeted/Facebooked last week, but those plans were brutally interrupted by none other than…snow! Surely you know from reading my often weather related photo summaries that I despise winters where I live mainly because they are brown and boring. When the vibrant palette outside transforms to that of a cardboard box, my inspiration suffers a devastating blow. Not to mention the horrible darkness! But there is one thing that lifts my spirits and that is snow! Of course being down south, snow is never a guarantee, so my hopes for glistening whiteness are often in vain. This year, I was prepared for more of the same. Not even forecasts could convince me, so you can only imagine my surprise when I woke up and looked outside to see the streets dusted in powdery white with more on the way! This was the perfect storm since last time it snowed, I had my old point and shoot with not nearly as many figures. Now with a huge selection of photographic subjects to choose from, a SLR, and improved skills, my dream shoot was finally here! But snow is not always something to cheer about because this storm affected the city and suburbs where I live rather negatively. To begin with, southern cities are never well prepared for winter weather for the simple reason that it rarely snows around here(I’ve never even seen a snowplow haha). Although snow was predicted, it was underestimated and schools and businesses which are usually closed at the mere sight of snow resumed as usual. This was the first mistake. Then it began snowing, and the mayor and districts decided to have early releases for schools and government workers. Businesses were also encouraged to send people home early. This was the second mistake. Why? Because what happens when you tell a city with six million people in it to go home? They go home. All at once. With a mass exodus initiated, the city’s already poor infrastructure was flooded, and don’t forget that it was snowing. So what happens when you take a lot of people who aren’t used to driving in the snow(not to mention black ice) and tell them to go home all at once? They crash! And with crashes, roads were blocked. And with roads blocked, tons of people, and snow, commutes suddenly take very long. My mom who works an hour away spent six hours driving home. A friends of hers who left work in the afternoon to drive home(fifteen minutes away) for lunch managed to return to work at midnight after never having made it home. A twelve hour drive home seems to have been the norm, and still others never reached home that night and resorted to sleeping in their cars or convenience stores. Some children even spent the night at school. Yet amidst the disaster, it was nice to hear that people did their best to help each other out by giving out water and food. I felt that before sharing my benefits from the snow, I should at least acknowledge the not so pleasant side affects and be grateful that my mom returned home safely. Now where were we…oh right, hooray for snow! The snow began Tuesday afternoon and fell into the night. Wednesday presented a full day of snow, and by Friday, the sun had already begun to take its toll. This gave me one and a half good days for photos! Looking back, Tuesday gave me the best photos not just because little flecks were captured in the shots, but because the overcast sky contributed a lot to the wintery atmosphere. Sadly, I spent the majority of Tuesday watching Fellowship of the Ring for the zillionth time waiting for proper snow coverage, so there are not many photos from that day. Regardless, snow is snow (especially when you’ve been waiting so long for it), so I’m happy to have had anything! Figmas may be my area of expertise, but I dislike the lack of attention my dolls have been getting, so they were first to venture out into the vortex! A big part of the fun of dolls is finding the perfect outfit for any occasion. 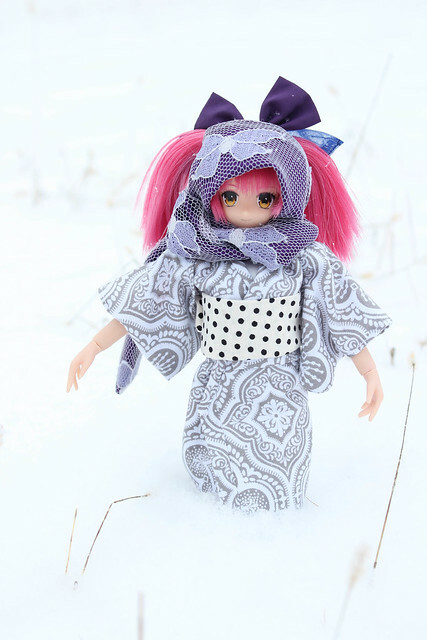 Tamaki was wrapped into her grey kimono made just for Christmas, but this time I accented it with purple in the form of a lace headscarf and socks. No jacket this time because none of the ones I made for her matched. Fashion is suffering. Review: figma Kyoko Sakura Casual ver. My apologies for the wait, but I’ve finally gotten myself to sit down and write…er type. 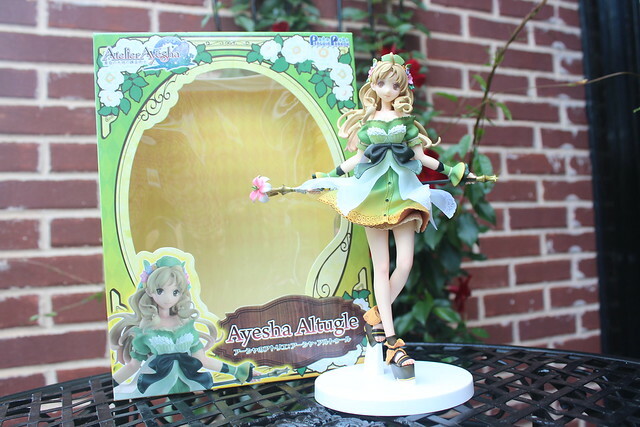 Today I’ll be reviewing figma Kyoko Sakura by Max Factory! This review contains spoilers for Madoka Magica. Kyoko is the fifth and final magical girl to appear in the ever popular, yet slightly depressing, anime Mahou Shojo Madoka Magica(AKA Puella Magi Madoka Magica). Whereas the others are fairly kind and reserved, Kyoko’s abrasive personality makes her unlike the average magical girl, and difficult to get along with. This is especially the case with Sayaka, who Kyoko clashes with immediately due to the girls’ differing opinions on how magic should be used. The two fight desperately on several occasions, yet the madness and hatred is soon brushed aside as Kyoko’s past is unraveled and we learn that she lost her family after making a wish for her father’s sake and only wants to help Sayaka before she too falls victim to unending regret. Of course, Sayaka’s fate is already sealed at this point, but the two are able to understand each other at least to the point that Kyoko sacrifices herself to defeat Sayaka’s witch form and spare her from loneliness. My feelings for each girl are roughly equal, but after watching the first two Madoka Magica movies, I was reminded more of what I like about Kyoko. Upon her debut, it’s easy to designate Kyoko as one of the selfish magical girls Mami spoke of who only wants power. Kyoko herself perpetuates this by suggesting that Sayaka wait until a familiar has killed a few people to battle it and mocking those who fight for justice. But as we learn of where Kyoko came from and the story reveals that other magical girls are not the true enemy, Kyoko’s story reminds us that being a magical girl isn’t all about cake and glitter. In fact, the horrible outcome of her selfless wish plants some of the first seeds of doubt in the integrity of the magical girl system, and teaches Madoka about the desperation, pain, and suffering with which magical girls fight for their wish, and this no doubt has some impact on her own wish. In short, I think that Kyoko is a very important character from a plot perspective and contributes to the depth that makes Madoka Magica so enthralling. 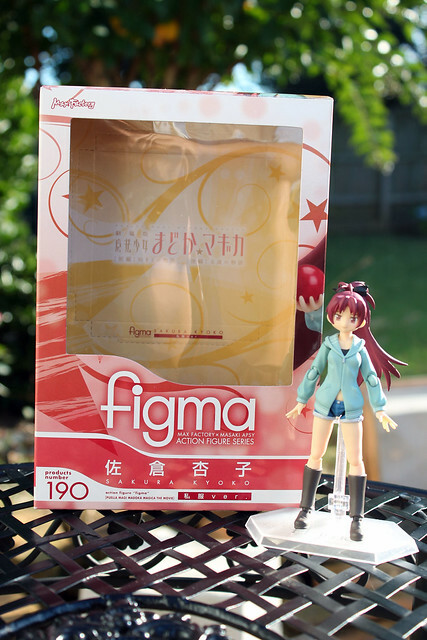 Behind her magical girl version, this is the second figma of Kyoko, and she is the final Madoka Magica figma in all. At least that’s true for now. With one more movie on the way, I get the feeling that a few more figmas are inevitable. Kyoko’s box is a cherry red with the star design that covers all other Madoka Magica figma boxes. Inside is the usual Di:stage punch out which is yellow.